Wet n Wild is hands down one of the best drugstore brand in the beauty industry and its products never fail to amaze me. Today I will be reviewing the Dewy Face primer. For Non Indian : Click Here to Buy. I got it from Flipkart at 50% off. 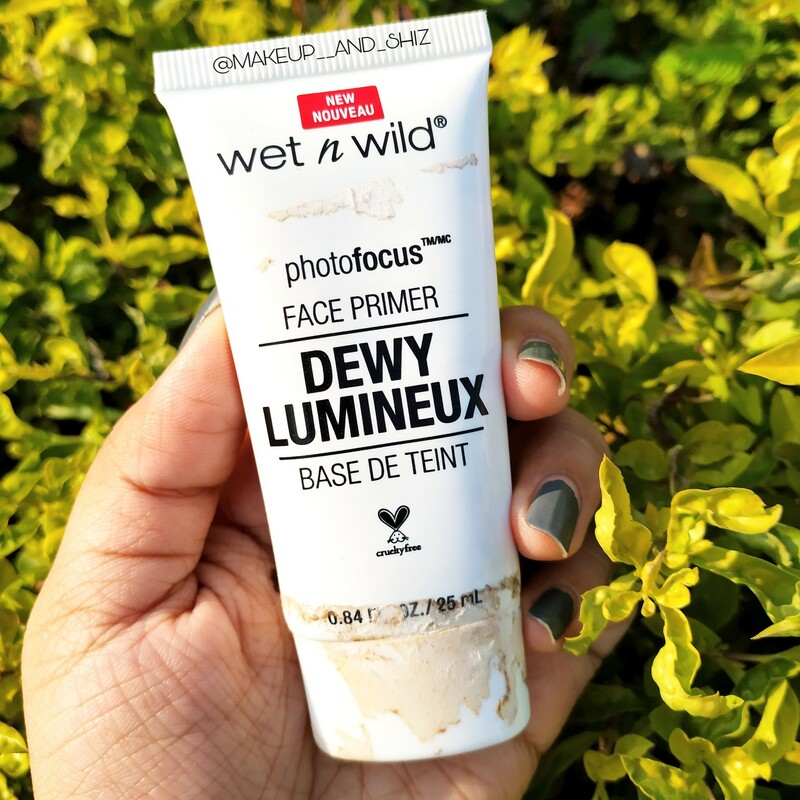 Flipkart has always 35% or 50% or some sale on WetnWild Products. Creates a smoother, more flawless base. Ensures your makeup stays long-lasting. Helps smooth your skin for an even makeup application. Cruelty-free, gluten-free, fragrance-free, paraben-free and vegan. It comes in a white tubed packaging. It has a tiny small opening. It doesn’t leak and also is very travel friendly. To be honest ,I love using this. I use it as a primer beneath my foundation. When used with a dewy foundation, it gives a shiny, illuminous finish to the skin , which I love. When used under a full coverage matte foundation it really doesn’t seem to have any effect as much. I love mixing with my foundations to shear it down or give that dewy effect. The last way, I use it as my liquid highlighter on my bare face. Looks very subtle. Not at all chunky or glittery. Well as a primer , it’s slightly sticky but I would suggest you using another primer beneath it. It has a champange Tint and a very creamy texture. It’s is sticky in nature ( not too much though). Yeah, I will totally recommend this. However given for the price the quantity is just 25ml. I will highly suggest you to get this in sale. For my oily/combination skin girls, I don’t think you would want to use it as your main primer but as a subtle liquid highlighter, definitely a yay! Also, I don’t own or haven’t used Becca Backlight Filter Primer, but I have heard (internet ) that this might be the dupe for it. This was all for this post! Have you used this? Comment and let me know. Previous Innisfree Capsule Recipe Pack – Canola Honey –Review, India. Next Dot and Key Underarm Detox & Color Correction Mask — Review. Looks like it could be an excellent highlighter!